Happy September!! We're basically counting down the days until autumn now. Summer went by rapidly, as it ALWAYS does. Goodbye shorts. I'll miss you. The hot pool days & warm nights are coming to an end. This brings me a bit of sadness, but fall carries some wonderful times as well. 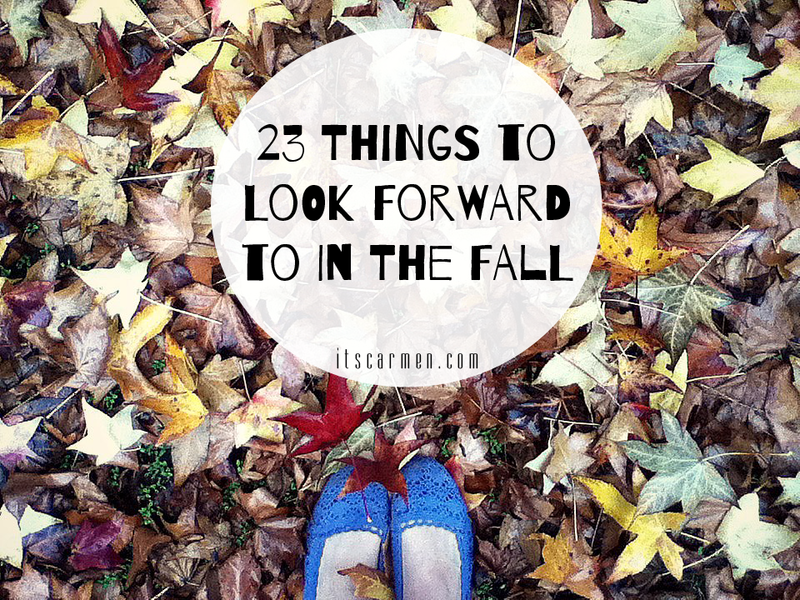 I've got a list of 23 things to look forward to in the fall to pump you up. Enjoy! Let the countdown begin! 1. Spiced food & drink - Ooooooooh yeaaaaaaah. A spiced beverage or dish can include a variety of aromatic plant substances, such as cinnamon, cloves or nutmeg. I love sipping on a hot spiced latte or gingerbread tea or perhaps munching on a spiced banana loaf. Divine! I buy pumpkin spice mix & put it in everything!! 2. Pumpkin - Pumpkin pie. Pumpkin frappe. Pumpkin bread. Pumpkin cheesecake. Pumpkin ravioli. Pumpkin soup. Yes to pumpkins. Now is the time to use this seasonal must have. Pumpkins are versatile & delicious. You can bake them in a dessert or eat them as a side dish. 3. Layers - It's going to get nice & brisk outside. It's time to bust out the box of cardigans, sweaters, scarves, beanies, & layers that you stored in your garage during the scorching months. Hooray! I'm thrilled to wear items that I've been hoarding away all year long. It's like getting free clothes. 4. Halloween - The cobwebs, witches, zombies, pumpkins, & assortment of candies are bound to come in the next couple months. Just you wait. I've already seen costume shops in the works. You know it's legit when those start popping up. Halloween is the beginning of the upcoming holiday festivities to last us through the end of the year! Click here for the Ultimate Autumn & Halloween Guide. 5. Falling leaves - Take a good look at the leaves now. They're green. 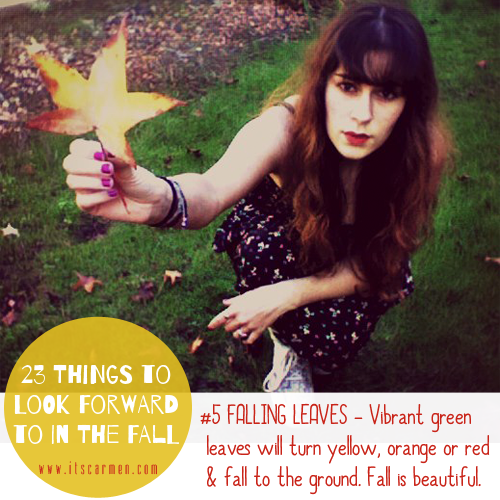 In a few weeks, the gorgeous & vibrant green leaves will turn a yellow, orange or red color, crumple, & die. Okay wow, that sounded depressing. But what I'm trying to say is that there is beauty in the assortment of fallen leaves. Fall is beautiful. 6. No Shave November - Oh yeah! 7. Rainy days - First the days & nights start to cool off. Next, it begins to drizzle. I can't wait to get my shoes wet & give a kiss in the rain & bask in the glory of nature. California rarely gets rain. This year's drought has been especially horrible, so I'm hoping for a miracle! We need the rain desperately. 8. Extra blankets - Sleeping with a thin sheet works in summer, but it's time to get comfy during autumn. Say hello to all those blankets you tossed aside. They're happy to see you. I especially adore those cozy, fluffy ones that feel like you're nestled warmly within the pouch of a kangaroo -- that's what I imagine anyway. 9. Crisp fall days - Picture this: it's a November morning. It's cloudy & cool. Just how it's supposed to be. 10. Chilly fall nights - After a crisp fall day, comes a chilly fall night. Don't mind if I do. 11. 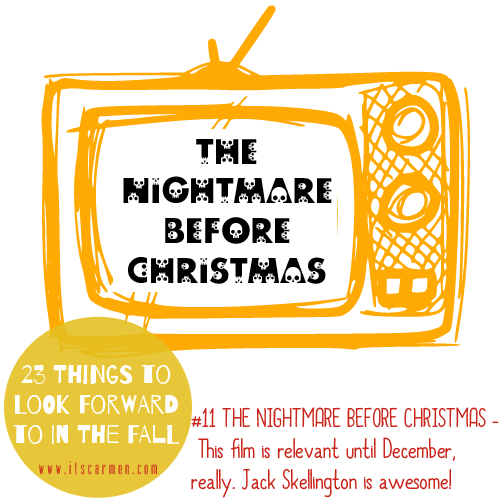 The Nightmare Before Christmas - This film is relevant until December, really. Jack Skellington is awesome! If you're able to visit Disneyland, go during autumn. The Haunted Mansion ride is decorated to perfection during Halloween. 12. Hocus Pocus - This time of the year is perfect for watching your favorite childhood Halloween movies. Hocus Pocus is an obvious choice. 14. Apple cider - You have to sip some apple cider at least once during the fall. It's got that harmonious mix of apples & spice & warmth. Plus, it makes your house smell nice. 15. Football - The football buffs out there are psyched that it's that time of year. Be it college football or NFL, autumn is the time of year when fans get to watch their favorite team play (& hopefully win!!) against rival opponents. There's also fantasy football, which is a league of its own. 16. Tea - How could I forget?!!! TEA! I love tea. I drink it almost every day (unless it's a brutally hot summer's day). You can make your favorite green tea or chai tea or fancy shmancy tea all season long. Time to get cozy! 17. Baking - At some point this fall, you must bake something. It can be a simple store-bought pumpkin pie. It can be a tasty cupcake recipe you found on Pinterest. Or perhaps it's cookies for your work party. But you will bake. And it will be amazing. 18. Stepping on leaves - The autumn winds have swept the leaves from the trees. They've fallen gracefully onto the ground. What do you do? Crrrrunch. Boy does it feel good to give a good bashing to some leaves! Stomping on the dead leaves used to give me such joy as a kiddo. 19. Dia de los Muertos - The "Day of the Dead" is a celebration that salutes the presence of the dead souls among living ones. The dia is known for its symbolism such as skulls, rosaries, masks, flowers, & candles. 21. Black Friday - I did Black Friday once & it wasn't for me. Maybe I'll try again soon. However, Black Friday brings ridiculous deals on anything you could possibly imagine. Do you do Black Friday? 22. Leftovers - You know what I'm talking about!! The week after Thanksgiving is delightful due to the massive amount of leftovers. Breakfast, brunch, lunch, snack, dinner, dessert, whatever. Leftovers rock! 23. Gratitude - This is the time of year when you get to go back home for the holidays. You get to be around the people you care about. You eat scrumptious foods. You see old friends. This time of the year -- as well as all days of the year -- is a wonderful time to have some gratitude. Be thankful! I was looking forward to Autumn, but after reading this post I want it right NOW. I am done with this warm weather nonsense. Give me PSL and my scarves, please! I love summer but I always get so excited for spiced-everything, all the leaves and holiday baking. Such a cute post. Great list, enjoyed the post! ahhh yes layers! that is one thing i am def looking forward to this fall season thank you so much! cant wait to check out your blog more! Great post, fall is my favourite season! So many of these are so AMERICAN, and I absolutely LOVE it. I swear in the UK, Autumn just means "new school shoes, more rain, people grumbling about christmas, and everyone getting a cold"... Maybe I'm being pessimistic... Personally, I absolutely adore Autumn - it's my favourite season these days. Perhaps that's because I read so many American blogs and watch so many North American Youtubers!! Autumn is not my fav season, but it's beautiful. Nice selection!!! Fall is y favorite season!! I love your list! Fall is my favourite season and I cannot wait for it to come :) MY favourite part about it is probably wearing sweater, ankle booties, pumpkin lattes and long autumn walks. I love fall so much!! Pumpkins, leaves, spiced everything!!! I couldn't agree more! Thanks for sharing Miss!